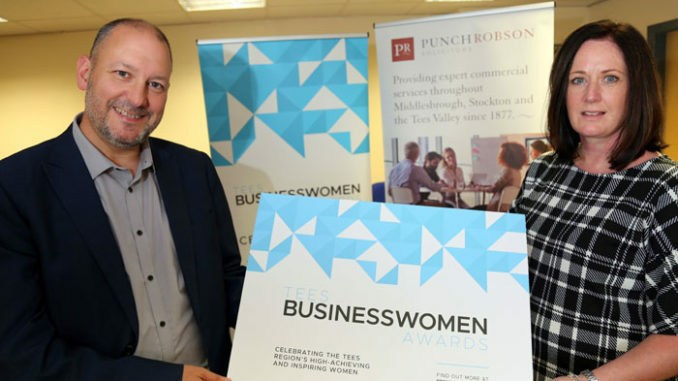 Local law firm Punch Robson Solicitors is the latest company to support the first-ever Teesside business awards for women by sponsoring one of the categories. Tees Business will host the Tees Businesswomen Awards at a glitzy ceremony in Wynyard Hall’s Conservatory Room on November 8 this year. Punch Robson, which has three offices on Teesside, is sponsoring the SME of the Year category for the historic event, following in the footsteps of Teesside University (Businesswoman of the Year), Cornerstone Business Solutions (Business of the Year) and RMS Recruitment (Best Newcomer), while another well-known Tees name has also sponsored the Training & Apprenticeships category. Punch Robson, which has two main offices in Ingleby Barwick and Coulby Newham, plus an office in central Middlesbrough, has been providing expert private and commercial legal services across the North East since 1877. The firm’s extensive services cover employment and corporate law, conveyancing, divorce and family law, mental health and capacity, disputes, wills and probate, personal injury and more. Managing partner Elaine McLaine-Wood, pictured above (right) with Tees Business co-editor Dave Allan, said: “Being a female managing partner, which is quite rare in the law profession, we want to celebrate the success of women in the area. “We have a number of female clients who run their own businesses, so we feel it’s important they get the recognition they deserve. The Tees Businesswomen Awards will celebrate women in business on Teesside, inspiring a new generation of females to succeed in business, creating more female entrepreneurs and business leaders than ever before. Dave Allan said: “It’s fantastic to have one of the region’s longest-established law firms recognise what we’re trying to do with this awards event and support us by sponsoring a category. Ten awards will be dished out at the first Tees Businesswomen Awards ceremony on November 8, including Businesswoman of the Year, Lifelong Inspiration Award, Breaking the Mould Award, Inspiring Others Award, Best Newcomer and SME of the Year, among others. Sponsorship opportunities are still remaining for other organisations keen to show their support for successful Teesside businesswomen. Click here to find out more info – alternatively email info@teesbusiness.co.uk or call 01642 450255.